Last week in the Great Books Project we passed the 4,000-page mark in Philosophy/Theology. Huzzah! This week we complete the only extant trilogy of plays from ancient Greece. That will allow us to change things up a bit next week. Things can get a little overwhelming when mired deep in five long works as we are now. Tom Jones by Henry Fielding, Book III: Fielding makes Tom’s relationship with the gamekeeper and his family almost the entire reason for his decline in reputation. The loyalty and charity he shows them are of course admirable, especially considering that he is the primary cause of their misfortune. The changing dynamic between Mrs. Blifil, the boys, the suitors, and Mr. Allworthy himself is strange, but I suppose a lot can happen in fifteen years. “The Names of God” by St. Thomas Aquinas: There’s a lot of tight reasoning here to demonstrate that God can be named, that the names of God are not all relative, and that we can indeed formulate propositions about God. Once more Aquinas answers all sorts of objections I never anticipated. 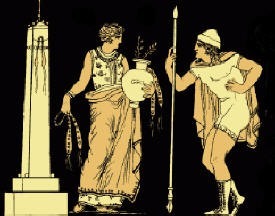 The Libation Bearers by Aeschylus: On this read through the play, I wondered more about Electra than I had previously. Clearly she deplores her mother’s actions and wants revenge. Why has she done nothing all these years? Iphigenia is not mentioned at all from what I could tell; does Electra not mourn her sister’s loss, or was she too young to remember it? Clytemestra is not at all sympathetic in this play. She rejoices when given the false news of Orestes’s death, an odd reaction when the death of Iphigenia propelled her to such monstrosities. An Inquiry into the Nature and Causes of the Wealth of Nations by Adam Smith, Book IV, Chapters 4-5: Chapter 4 provides another reason (if another were needed) for modern redistributionists to dislike Smith. His contention that “drawbacks” (or tax credits/deductions) for exporters are benign because they encourage capital towards its natural destination flies in the face of those who argue that tax credits are government expenditures. The much longer chapter on “bounties” (export subsidies) ought to be required reading for anyone who ever wants to voice an opinion on foreign trade. The Descent of Man by Charles Darwin, Chapters 5-6: Modern critics of Darwin frequently call attention to unflattering comments he makes about various racial and ethnic groups. His defenders insist that these are no big deal or overblown. But they seem to form an important part of his argument in these chapters. His discussion of birthrates of Irish vs. English, for example, draws heavily on the assumption that the Irish are inferior biologically to the English. An Essay Concerning Human Understanding by John Locke, Book IV, Chapters 1-4: According to Locke, knowledge is simply the understanding of the relationship (agreement or disagreement) between two ideas within our minds. It’s easy to see how this understanding leads to Hume, Kant, and the rest. Locke says that knowledge exists by degrees and varies in extent, but that it is real, even with respect to moral ideas that are of our own making. I came successfully through surgery yesterday to remove skin cancer from my cheek and now have a huge bandage on my face. It makes eating and speaking a bit awkward, but hopefully will not inconvenience me much longer. Our child, who was due Monday, has yet to make an appearance, and we are all befuddled. Hopefully I’ll still be able to keep on the reading schedule over the next week or two and maybe even make up a few days.